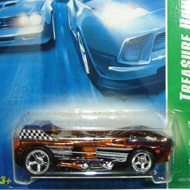 4/12 from the 2007 Super Treasure Hunt series. The Corvette has dark grey metalflake paint embellished with blue and olive green stripes on the top. 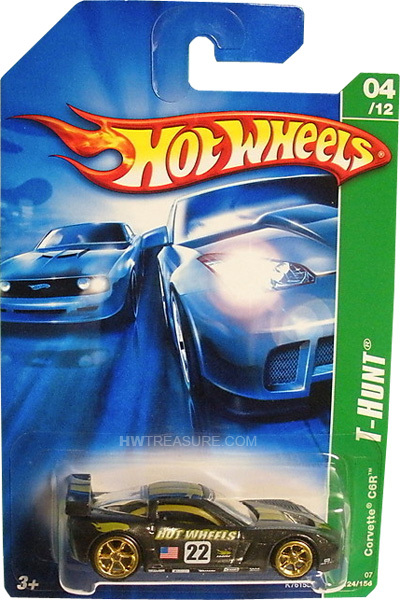 The sides have “Hot Wheels”, “22”, the U.S. flag, and a variety of logos. It has clear windows, black interior, olive green rollcage, gold 6-spoke Bling wheels, and a grey plastic Malaysia base.